Cotton acreage has almost tripled in the last five years in the Texas A&M AgriLife Extension Service District 1, which covers the 22 northernmost counties in the Panhandle. Dr. Jourdan Bell, AgriLife Extension agronomist in Amarillo, said the cropping picture has definitely changed as producers dealt with declining irrigation capacities, variable weather and lower commodity prices. In 2013, producers in District 1 planted 300,000 acres of cotton, compared to the 850,000 acres planted in 2018, Bell said. Of that 550,000-acre increase, 350,000 acres have been north of Amarillo. Although cotton production increased in every county, the largest expansions appear to be in Dallam, Hartley, Hansford, Moore, Ochiltree, Sherman, Carson and Gray counties, she said. “Some of the increase is occurring where irrigation water is becoming more limited, but we are also seeing an increase where producers have irrigation capacity to achieve higher cotton yields, as well as a shift in dryland acres from wheat and sorghum,” she said. 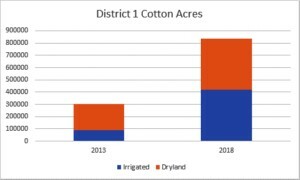 In 2013, less than a third of the cotton acres were irrigated, but in 2018 about half of the acres were planted under irrigation. Cotton in this region is estimated to require 12-15 inches of total water to produce two bales per acre, so only about 8 inches of irrigation are required in most years when soil moisture and in-season precipitation are average. The more drought-tolerant cotton also provides producers an opportunity to stretch irrigation capacities, allowing them to water both corn and cotton, Bell said. It can be risky for producers to plant their full acreage to corn with limited irrigation capacities due to variable weather patterns. 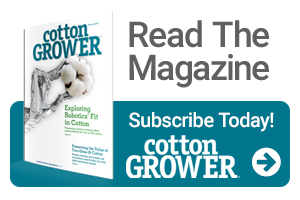 “Because cotton is a drought-tolerant crop, splitting irrigated acreage between cotton and corn provides producers the opportunity to better manage both crops during peak water demand periods and maintain high yields for both crops,” she said. While many have added cotton to their rotation, they have not totally eliminated their grain acreage, Bell said. The grain crop enables weed management by rotating herbicides, helps break disease cycles and adds residue, which is a key component for minimizing evaporative losses and improving soil quality. About 20 inches of irrigation will produce on average 230 bushels of corn per acre and 2,000 pounds of cotton per acre, said DeDe Jones, AgriLife Extension risk management specialist, Amarillo. “Based on 2019 price and cost projections from Texas Panhandle AgriLife Extension budgets, $4.15 per bushel corn will net around $300 per acre, while $0.68 per pound cotton will net almost $600 per acre, meaning cotton can be a very attractive crop to area producers,” Jones said. She warns, however, cotton can be a riskier choice due to higher potential expenses and lower insurance coverage. Bell adds that cotton markets are far from certain. “Because a portion of the current change in acreage is due to economics and fluctuating commodity prices, there are questions about the stability of current cotton acres,” Bell said. But both Jones and Bell feel the combination of several factors – declining irrigation capacities providing producers an opportunity to maintain the profitability of low-water acreage, investments made in cotton equipment and increased ginning capacity – suggest a regional commitment to cotton acreage.